Most of us use pen in our walking lives, so why not treat your hand with the finest ones ever made? A luxury pen is a practical yet lavish tool that can offer you years of reliable service. These are the stylish writing tools that not only add flair to your writing but also offer the best writing experience. 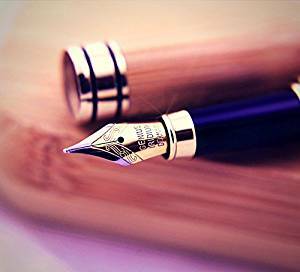 The feel of a good quality pen and its smoothness on the page is a real luxury. Some of the most commonly found luxury pens are rollerball, ballpoint and fountain pen. Here are some of the features you can consider while buying a luxury pen. 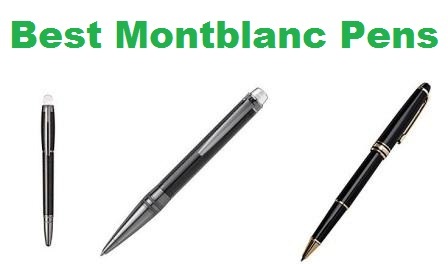 Check out our complete guide about the best montblanc pens. When looking for a luxury pen, there is no other better way to start the search than by considering which kind of pen do you want to have. Majorly, there are three basic varieties of luxury pen you can consider – rollerballs, ballpoints and fountain pens. 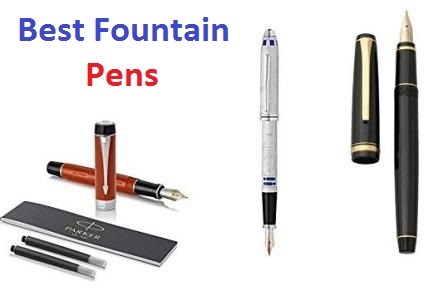 The most luxury one clearly is the fountain pen, and that’s because of the fact that it utilizes a metal nib, is usually made out of solid gold, contains an internal ink supply mechanism through replaceable catridges, a built-in internal reservoir, and a refillable converter. All these attributes offer the elegance and sophistication in the writing process. And for the buyers who are looking for all these attributes in their luxury pen, fountain pen should certainly be their pick. Apart from this, these days several luxury writing tools are made out of ballpoint variant also, which come with replaceable refills. They offer a convenience of click-top action or a twist, making the tool a perfect choice for all those who need something active, on-the-go types. Rollerball pens, on the other hand, provider greater level of smoothness to the writing, and just like the ballpoints, they come with disposable refills. These pens mostly have twist-on cap or utilize a screw. 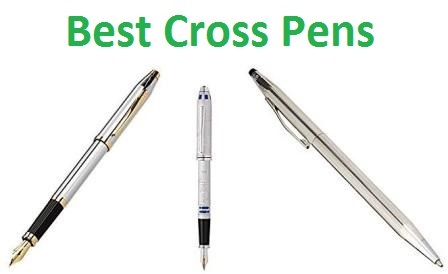 Luxury pens can be quite expensive but last for many years – if not for a lifetime. The fountain pens normally price in the mid-$100 range, and you can get some of the entry level fountain pens for this amount. But some highly luxury ones even cost thousands of dollars, making them a tool for elite writing. So, there is entire spectrum that they are available in. Also, check how it balances at the time of writing. Hold it in the crook of your index finger and thumb and hold it lightly. Try writing and see if it exerts any kind of weight towards the ends of the pen. If it comes with a cap, it is supposed to be secured to the back for balancing act. The idea is the pen should be comfortable to be used – whether light or heavy, it should be able to maintain the overall balance. 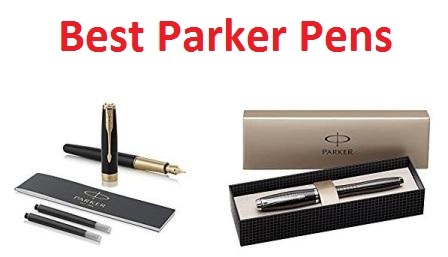 We have also written a complete guide about the best parker pens. Another factor to consider while choosing a luxury pen is the material used to make the barrel and the cap. While various good quality tools use high quality resins, which is a perfect sign of high end luxury pen, the use of hard-worked material such as celluloid, metal or ebonite hard rubber is what gives it the perfect touch. Ebonite hard rubber is a great material for making luxury pens and there are several vintage pens that are made using this material. The high quality celluloid comes with a long history associated to it, and it remains the icon of specialty to the elite manufacturers. Wooden pens have their own story, and these days even the metal – silver and gold pens are available for affordable prices. 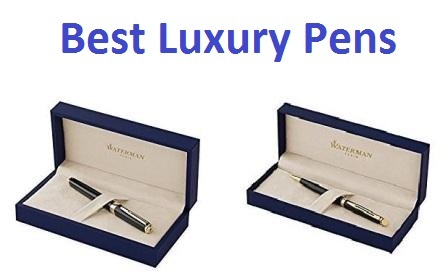 As there is a great variety of luxury pens available in the market today, people look at the finish as one of the criteria to choose their pen. But whether you are inclined towards the luxury engraved metal ones or the colorful plastics, you must always check the finish of then pen for quality. The pattern given to the pen should align well on the barrel and cap when it has to be closed. To check for rough edges and stubborn burrs, run your fingers along the length of the pen. Also, understand the fact that the celluloid and acrylic finish would look the same to your untrained eye but celluloid requires more specific manufacturing techniques. A symbol of fineness since 1921, Duofold remains the most notable pen in Parker’s astute history. 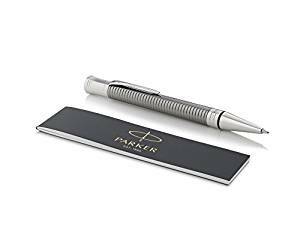 Adhering to this excellent and driven by a commitment to offer its customers world-class craftsmanship, every detail of Parker Duofold Ballpoint pen is well thought of and created. From the characteristic design of the ace to the precious metal finishes, every pen they design is meticulously brought together by hand to ensure it gives the user finest writing experience. The Parker Duofold Prestige Chiselled Rollerball Pen comes to the users in a beautiful luxury gift box. These are some of the features that separates it from various other brands. Parker Duofold Prestige is a Ballpoint pen that gives the refined pleasure of genuine writing experience for a professional touch. It comes with medium sized ballpoint tip and black ink. The Parker Duofold Ballpoint pen is available in the price range of $300 – $400. It feels quite solid in the hand and comes with retractable twist mechanism. Duofold ballpoint pen is constructed from 21 high-quality, individual pieces and a range of precious metals. These materials are skillfully weighted and balanced for a luxurious and comfortable feel. Each and every detail around these pens is carefully considered and brought together precisely to ensure the finest writing experience to the users. The Duofold Chiseled Prestige line highlights proficiently chiseled patterning on a ruthenium base, with palladium trim and an 18-carat, solid gold, bi-tonal, hand-polished medium nib. Waterman Paris is known as the Heart of Parisian Elegance, and this is mainly because the brand has sought to marry three essential elements that make a great quality pen – innovation, excellence and design. With the perfect combination of these three ingredients, Waterman has managed to create some of the world’s finest and stylish writing instruments. 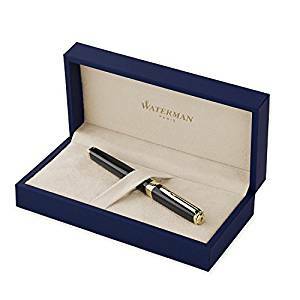 And in this disparate era where only a few dare to uphold the tradition, Waterman is capable of recapturing the savoir-faire and style with its Carene fountain pen, which is the perfect symbol of design and engineering marvels. From the scrupulous craftsmanship of the barrel and flawless balanced lines to the permissive luxury and high precision of the nib, the pleasure and attractiveness of the pen is once again within your grasp. Waterman Carene S0909850 is a fountain pen that gives the refined pleasure of genuine writing experience for a professional touch. It comes with medium sized streamlined, unique nib that offers you with a supple thrill as it glides wonderfully on the paper, creating fluid curves and bold lines with grace. The Parker Duofold Ballpoint pen is available in the price range of $250 – $350. The sleek and distinguished style of Carene is surely going to win your heart. 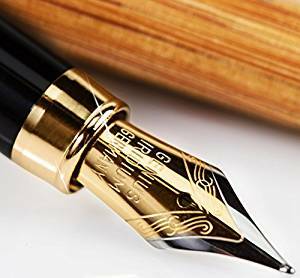 The barrels of Waterman Cerene fountain pen is made out of lacquer, silver plating material, and the nib is flawlessly carved out of 18k Solid gold. The exclusive integrated rhodium-plated Waterman Carene Fountain pen comes with 18-carat solid gold nib that induces a dropping bow steering infinite possibilities of a pure white page. With its ripped luminescent curves, immaculate and monochrome, fringed with palladium-plated trims, exude the richness of its design. Skillfully made in France, every pen showcases the genius founder Lewis Edson, who invented the first reliable fountain pen in 1883. The world of Parker spans more than 100 years of unique style, world-class craftsmanship of fine writing tools and innovation. Showcasing the prestige and sophistication, Parker crafts pens using exquisite material blending it with intricate aesthetic and formal style. The design of Monochrome rollerball pen delivers bold fluid lines. Available in an entire gamut of elegant body finishes and trim designs, the Parker Premier Rollerball Pen offers a truly comfortable and exceptional writing experience. Parker Premier is a Roller pen that gives the refined pleasure of genuine writing experience for a professional touch and let your creativity flow with the constant fluidity of the ink. The pen is known for its convenience and smoothness. It comes with a fine tip and one black ink easy to refill system. 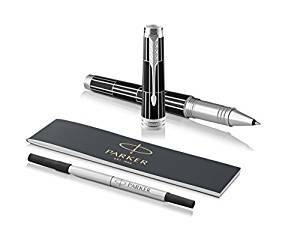 The perfect companion for different types of writing, Parker Premier roller pen is available in the price range of $250 – $300. It features a balanced, sleek shape that sits comfortably in the hand, and the rounded barrel accommodates different handholds and facilitates excellent penmanship. Constructed using precious metals, Parker Premier pens deliver a contemporary aesthetic, bold look that commands attention. The deep dark matte black ceramic finish select to the monochrome collection is complemented by the signature arrow clip in black. Created in an intricate manner with a piercing matte black ceramic finish and black trim, the rollerball pen makes an assertively elegant statement. its brilliantly smooth rollerball tip provides fluid, skip-free writing that makes sure you leave striking marks wherever you write. Combining refined details with smoothness, these luxury rollerball pens offer unmatched precision and comfort for an extraordinary writing experience. Exception is a miracle of technical originality, and Waterman Exception Slim fountain pen adheres to this. Holding an elite pen of this shape not only adds an element of style to your personality but it also works brilliantly. To make you feel sublime in the hand, it takes immense skill, and Waterman Exception has it in it. It ensures that when you write with an Exception, you can feel the stimulus flowing from its charismatic lines. So, try out the Waterman Exception fountain pen – a Waterman masterpiece that echoes the magic of inspiration. Make your touch as special as your Waterman with its Exception slim fountain pen. Choose your ink to match your inspiration, and to flow as freely as your ideas. It comes with a medium nib, and the strikingly different square shape makes every detail a new challenge. The Waterman Exception fountain pen is available in the price range of $300 – $400. It feels quite sublime in the hand and an astute bayonet system ensures the cap always realigns squarely. Purity reigns. An intricately engraved 18K solid gold nib featuring a modern expression of Waterman’s ideal and globe signature. With extreme precision, four brilliant layers of lacquer are applied then removed, miraculously resisting the rigors of gold plating. A striking combination of rich black lacquer and fine gold-plated trims makes this refined modern classic pen stands out from its competitors. The world of Parker spans more than 100 years of unique style, world-class craftsmanship of fine writing tools and innovation. Showcasing the prestige and sophistication, Parker Premier rollerball pen features a sophisticated design that is created by combining exceptional legacy of its craftsmanship. Constructed using precious metals, Parker Premier pens deliver a contemporary aesthetic, bold look that commands attention. The deep dark matte black lacquer finish is complemented by luxury chrome trim. Created in an intricate manner with a piercing matte black lacquer and a soft rubber feel, this rollerball pen is complemented by contrasting palladium graphic lines and trims. The writing tool makes an assertively elegant statement. its brilliantly smooth rollerball tip provides fluid, skip-free writing that makes sure you leave striking marks wherever you write. Combining refined details with smoothness, these luxury rollerball pens offer unmatched precision and comfort for an extraordinary writing experience. The Waterman Expert Fountain pen is the apogee of stylish and smooth writing instruments. So, do not settle for anything less than perfection as Waterman Expert fountain pen bridges the worlds of fashion and performance, aesthetics and business. From its brilliant cigar-shaped silhouette to its sophisticated nib designed specially to make every mark with clarity and precision, the Waterman Expert Fountain pen is a perfect combination of engineering and art that comes down to us from a long history of Waterman classics. When you have a Waterman Expert in hand, your colleagues and clients are surely going to know you by your taste for refinement. Waterman Expert is a fountain pen that gives the refined pleasure of genuine writing experience and its unique, streamlined nib offers the users a supple thrill as it smoothly glides over the paper. It comes with a fine nib and blue ink. 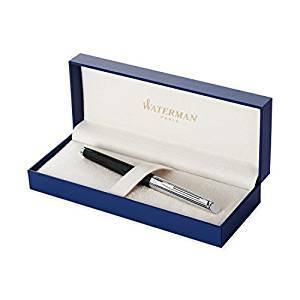 The Waterman Expert fountain pen is available in the price range of $50 – $150. It delivers fluid curves and bold lines with an authority and grace of an aristocratic hand. The barrels of this stylish, contemporary piece is made up of lacquer, stainless steel and the nib is stainless steel, giving it a business chic look. As contemporary as it is timeless, the Parker Expert fountain pen matches lacquer of an absolute black with the brilliance of palladium-plated trim. Waterman Paris is known for its elegance from past 130 years, and this is mainly because the brand has sought to marry three essential elements that make a great quality pen – innovation, excellence and design. 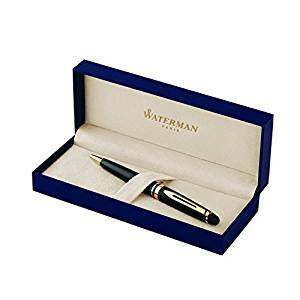 In this disparate era of objective communication where only a few dare to uphold the tradition, Waterman is capable of evoking the sophistication and finesse with its Carene fountain pen, the perfect symbol of movement, design and engineering marvels. From the scrupulous craftsmanship of the barrel and flawless balanced lines to the permissive luxury and high precision of the nib, the pleasure and attractiveness of the pen is once again within your grasp. Waterman Carene S0700320 is a fountain pen that relishes the purest traditions of liquid ink, while delivering beautiful curves and solid lines. It comes with medium sized streamlined, unique nib that offers you with a supple thrill as it glides wonderfully on the paper. The Cross brand, originated by artisans of usable luxury and jewelry makers, has been creating fine writing instruments for more years than any company in the Western world. And their Luxury Collection is the culmination of this chase. Embracing both evolution and tradition, the Cross profile comprises of four iconic designs in precious metals like platinum, gold and silver, as well as beautiful details like inset precious stones. The unique and timeless collection by Cross is well recognized by its “X” Authenticity Mark. The ink in the roller ball creates a smooth, fluid lay-down of ink just like that of a fountain pen. Unlike Ballpoint Pens, most of the Selectip Pens have a separate cap that prevents the ink from drying out. The Cross Century II rollerball pen is available in the price range of $100 – $200. Its balanced, weighted feel and lavish finishes gives a sense of purpose to anything you write. The Cross II rollerball pen is constructed from high-quality, individual pieces and a range of precious metals. These materials are skillfully weighted and balanced for a luxurious and comfortable feel. Each and every detail around these pens is carefully considered and brought together precisely to ensure the finest writing experience to the users. This rollerball pen by Cross II embraces both evolution and tradition with variety of finishes to choose from – Lustrous Chrome, Medalist Chrome w/23KT Gold, Black Lacquer/Gold, Black Lacquer/Rhodium, Translucent Blue Lacquer/Rhodium, 10KT Gold Filled, Sterling Silver. Known for its Parisian elegance from past 130 years, Waterman Paris manages to marry three essential ingredients that make a great quality pen – innovation, excellence and design. With Waterman, each pen brings along with it a unique writing experience. The timeless sensuality and distinction of the brand has assured its place in hearts of many. The brand is capable of evoking the sophistication and finesse with its Carene fountain pen, which is the perfect icon of movement and design marvels. From the reliable craftsmanship of the barrel and flawless balanced lines to the liberal luxury and high precision of the nib, the pleasure and attractiveness of the pen is once again within your grasp. Blue obsession from Waterman Carene is a collection that brings along with it Emotion, Imagination and Heritage. The instantly recognizable blue that has become the signature color of the brand, is so much more than just another shade. It reflects a certain blue mindset, which is serene and calm, yet brimming with creativity and inspiration beneath the surface. 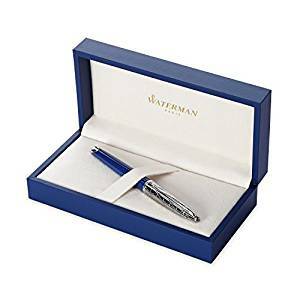 Waterman knows that everyone has an obsession that propels them forward and drives their ambition, and that’s why every pen in the Blue Obsession Collection has been conceived to inspire. Waterman Carene 1904558 is a fountain pen with bold and contemporary design with balanced lines. It comes with fine nib that offers you with a supple thrill as it glides wonderfully on the paper. Waterman Carene Fountain pen is available in the price range of $200 – $300. With its sensitive craftsmanship, the pen brings along with it sheer beauty and quality in your hand. It gives a sensual thrill of inspiration each time you see, touch and use it. 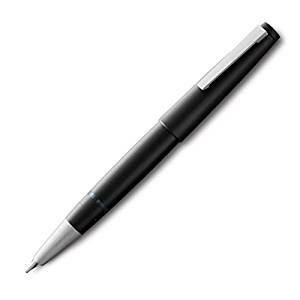 And because the obsession pen speaks to the furthermost reaches of your imagination, it conjures your most powerful ideas and channels them from mind, to nib, down to paper. The barrels of Waterman Cerene fountain pen is lacquered in deep blue, and the cap in PVD gun metal. The exclusive integrated Waterman Carene Fountain pen comes with 18-carat solid gold nib that induces a dropping bow steering infinite possibilities of a pure white page. With its ripped luminescent curves, immaculate and monochrome, fringed with palladium-plated trims, exude the richness of its design. A bold and contemporary design with pure, fluid and balanced lines. Known for its fineness, the Lamy 2000 fountain pen comes with a piston operated filling system that can be used with Lamy bottle ink T52. It doesn’t require any converter or ink cartridges. The scratchiness of the Lamy 2000 fountain pen is due to the increased pressure some writers tend to use, in an attempt to compensate for the over-rotation. The pen has a relatively small area referred to as the sweet spot, and using only acid-free, pH-neutral paper is recommended. Lamy 2000 is a fountain pen with extra fine nib, which gives it a classic modern design. The Lamy 2000 fountain pen is available in the price range of $150 – $200. The grip of the fountain pen feels substantial in the hand (25g/0.9oz), yet remaining easy to hold and write for long periods of time. The body of Lamy 2000 fountain pen is made of a combination of Makrolon (black fiberglass) and brushed stainless steel, which will keep your fingers comfortably in place avoiding any slippage. And the 14KT smooth gold nib is platinum coated. The piston operated filling system flawlessly integrates with the body making the knob unapparent. This way the pen is capable of holding a relatively large amount of ink (for use with bottled ink only). European nibs are generally a little wider than others, and that’s why if you like medium sized nib, you might have to look for a fine nib, and so on. An important thing to note about the Lamy 2000 nib is that it is less rounded at the tip than most other fountain pens. It is not just an accessory; it’s a statement. The new Waterman Expert Ballpoint marries refined Parisian styling with stylish executive tastes for a match that gives you the world-class quality. With its lavish cigar-shaped silhouette and affluence of fine materials, this expert ballpoint is an impeccable writing instrument that is as contemporary as it is timeless. Whether you are looking for a writing instrument to bring business deals to life or embellishing stationery with exquisite calligraphy, this pen will never disappoint you with its highest standards in precision, performance and aesthetics. The Waterman Expert is a ballpoint pen that is as smooth as silk and as precise as chapel. With its brilliant nib, you can create elegant, flawless words on the paper. It never bleeds, never dries out and never disappoints its users. So, mark those special moments with this exceptional writing piece. 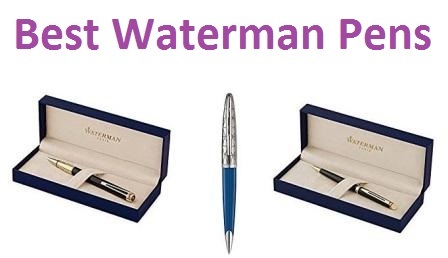 The Waterman Expert Ballpoint pen is available in the price range of $50 – $100. It feels quite solid in the hand and comes with smooth medium tip. The discreet golden gleam of the ballpoint pen trim complements its deep black lacquer, making it a powerful, contemporary combination of timeless elegance. The cigar-shaped Waterman Expert ballpoint pen comes with a golden trim. The new Waterman Hemisphere Ballpoint blends the utmost modern purity with the timeless touch of sheer elegance. The Waterman Hémisphère Ballpoint pen is a slim but powerful fine writing instrument, which combines pleasure and precision to design a luxury pen that truly elevates the writing experience. Its sleek and custom-made form is enhanced by a dynamic combination of elements like the slim clip, broad ring and engraved nib. With this Waterman Hémisphère Ballpoint pen, every mark you make showcases clarity and beauty. The Waterman Hemisphere is a ballpoint pen that is as smooth as silk and as precise as chapel. With its brilliant nib, you can create elegant, flawless words on the paper. It never bleeds, never dries out and never disappoints its users. So, mark those special moments with this exceptional writing piece. The Waterman Expert Ballpoint pen is available in the price range of $30 – $100. It feels quite solid in the hand and comes with smooth medium tip. The Waterman Hemisphere ballpoint pen comes with a golden trim. Opening and closing of the pen is not very smooth in the beginning, but it settles down after few days of using it. Challenge the status quo with the new Waterman Hémisphère Deluxe Fountain pen, which is a perfect combination of high performance and slender form. This executive pen redefines timeless lines with attractive precision and streamlined simplicity. From the embellished nib, precisely chiseled and expertly engraved, to the irrefutable contemporary elegance of the design, the Hémisphère Fountain pen pays homage to the creative and engineering genius of the Waterman line. Make luxury your new normal with this Deluxe Hemisphere fountain pen. The Waterman Hemisphere Deluxe is a fountain pen that is as smooth as silk and as precise as chapel. Its unique, streamlined nib provides you with a supple thrill as it glides smoothly across the paper, delivering bold lines and fluid curves with all the grace and authority of an aristocratic hand. The Waterman Expert Ballpoint pen is available in the price range of $50 – $150. It feels quite solid in the hand and comes with smooth fine nib. A fountain pen that is as smooth as your stream of consciousness – ZenZoi fountain pen is handcrafted to exude style with its bamboo exterior and flexible nib. Paired with an exquisite bamboo case, it makes a fantastic display piece and a superior writing tool then whether you want to use it for your signature or you are trying to show some artistic flair in your daily writing. Using this pen is pretty much simple. Jumpstart your pen as per the given instructions and let your creativity flow. And you will never get tired of the stream of compliments that you get from this wonderfully unique pen! ZenZoi Bamboo Vintage is a handcrafted fountain pen that comes with matching bamboo gift box. The vintage looking pen comes with a medium nib for smooth writing and the calligraphy set includes modern ink refill converter. The ZenZoi Bamboo Vintage fountain pen is available in the price range of $20 – $50. It feels quite comfortable in the hand and fits well. The antique, stylish fountain pen is made of real bamboo. The wood color and texture may vary or have natural marks but this is totally normal and is integral part of the natural, raw material. The vintage bamboo pen has a satin finish and is trimmed with gold that carries a classy stylish feel that works well in virtually any workspace. The Dryden Luxury Twin Pen Set smoothly blends contemporary style with sophisticated design for a truly smooth finish. While the luxurious set features rose gold-plated trims sparkling on a shiny polished body, a handcrafted fine nib completes the contemporary design. Known for its technical perfection and commanding style, the Dryden Luxury Fountain pens will bring you years of luxury penmanship. Not just this, the pen comes encased in a stunning, well-constructed gift box, which makes the twin set a perfect gifting choice; you can gift it to a loved family member, a precious friend or a corporate client. This exquisite gift comes to you at an unbeatable price that is guaranteed to be handed down the generations. The Dryden Luxury is a twin pen set that comes with a fountain pen and equally marvelous matching ballpoint pen and case. The Dryden fountain pen comes in an elegant, sophisticated matching bamboo case and it also doubles up as a great place to store your fountain pen. The Dryden Luxury fountain pen is available in the price range of $10 – $100. It is ergonomically designed to achieve a delicate weight comfort ratio. The Dryden luxury fountain pen is constructed from high-quality stainless steel material, which is skillfully weighted and balanced for a luxurious and comfortable feel. Each and every detail around these pens is carefully considered and brought together precisely to ensure the finest writing experience to the users. The luxurious set features rose gold-plated trims sparkling on a shiny polished body, and a handcrafted fine nib completes the contemporary design.